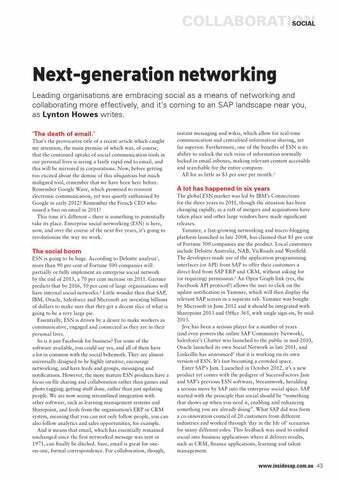 Next-generation networking Leading organisations are embracing social as a means of networking and collaborating more effectively, and it’s coming to an SAP landscape near you, as Lynton Howes writes. ‘The death of email.’ That’s the provocative title of a recent article which caught my attention, the main premise of which was, of course, that the continued uptake of social communication tools in our personal lives is seeing a fairly rapid end to email, and this will be mirrored in corporations. Now, before getting too excited about the demise of this ubiquitous but much maligned tool, remember that we have been here before. Remember Google Wave, which promised to reinvent electronic communication, yet was quietly euthanised by Google in early 2012? Remember the French CEO who issued a ban on email in 2011? This time it’s different – there is something to potentially take its place. Enterprise social networking (ESN) is here, now, and over the course of the next five years, it’s going to revolutionise the way we work. A lot has happened in six years The global ESN market was led by IBM’s Connections for the three years to 2011, though the situation has been changing rapidly, as a raft of mergers and acquisitions have taken place and other large vendors have made significant releases. Yammer, a fast-growing networking and micro-blogging platform launched in late 2008, has claimed that 85 per cent of Fortune 500 companies use the product. 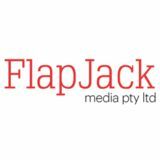 Local customers include Deloitte Australia, NAB, VicRoads and Westfield. The developers made use of the application programming interfaces (or API) from SAP to offer their customers a direct feed from SAP ERP and CRM, without asking for (or requiring) permission.4 An Open Graph link (yes, the Facebook API protocol!) allows the user to click on the update notification in Yammer, which will then display the relevant SAP screen in a separate tab. Yammer was bought by Microsoft in June 2012 and it should be integrated with Sharepoint 2013 and Office 365, with single sign-on, by mid2013. Jive has been a serious player for a number of years (and even powers the online SAP Community Network), Salesforce’s Chatter was launched to the public in mid-2010, Oracle launched its own Social Network in late 2011, and LinkedIn has announced5 that it is working on its own version of ESN. It’s fast becoming a crowded space. Enter SAP’s Jam. Launched in October 2012, it’s a new product yet comes with the pedigree of SuccessFactors Jam and SAP’s previous ESN software, Streamwork, heralding a serious move by SAP into the enterprise social space. SAP started with the principle that social should be “something that shows up when you need it, enabling and enhancing something you are already doing”. What SAP did was form a co-innovation council of 20 customers from different industries and worked through ‘day in the life of’ scenarios for many different roles. This feedback was used to embed social into business applications where it delivers results, such as CRM, fi nance applications, learning and talent management.